Things are getting ugly in France. Every morning I check my twitter feed I'm seeing images of French paramilitary literally body slamming not young hooligans but elderly individuals. Of course I'm seeing the most outrageous instances of violence by govt forces and I'm sure some protesters are dishing out pain too, but to see armored vehicles deployed against the citizens of a country is disturbing...at least to me. Having said all that, this write up is telling. It's from AntiWar.org, and I'll leave it to my readers to make up their own minds. Any Frenchmen in the audience are especially welcomed to offer their insight. The EU was a joint project of Euro-intellectuals who wanted a super-socialist State and were afraid Europeans might turn away from "Europe." They sought to create an ersatz Euro-nationalism that has still only caught on among deracinated yuppies and oligarchs, if anyone at all. What they wanted and still want is what every true state has – an army. Which Macron has been agitating about for some time now. He doesn’t want to persuade Italy and Poland and Hungary to take more refugees – he wants to force them. Even more, he wants a reliable force to crush domestic protests, one that is unlikely to sympathize with the protesters. Protests are everywhere: the media loves to cover them provided it’s the right cause – and one of the qualifying requirements of coverage should be drama. One would think therefore that the most recent and most violent would attract the media. Not so! We hear nothing about the twelve-week riots that have shaken the Macronist regime to its foundations. But as the so-called Yellow Vests run roughshod in France – and all over the self-proclaimed "anti-nationalist" Macron – their origins, their ideology, their story remains untold. French President Macron, a fanatic environmentalist, decided to revise the fuel tax code so that the small urban cars beloved by his circle had their tax reduced, while fuel for trucks and more industrial uses went up as much as 30%. It was a deliberate insult to the rural working poor who must drive long distances. Macron went out of his way to convey his contempt for the rural voters who did not vote for him. The original reduction was actually intended for long-distance fuel, but Macron changed it around at the last minute to punish this use. The French "Deplorables" reacted swiftly and not with the usual threat to strike: they simply started an insurrection. No preliminaries. They call themselves Yellow Vests referencing the safety vests required by French law of all motorists to signal emergency: yes, they declare: there IS an emergency going on! We are continually told the rebels are "Right wing" – the evidence being opposition to taxes, yet they have no aversion to receiving government largesse-provided it’s distributed fairly. I would remind you of the context in which all this happened: the aftermath of Macron’s anti-nationalist reaction to Trump’s America First doctrine. The French are fighting the Yellows Vests tooth and nail, but not with much success. 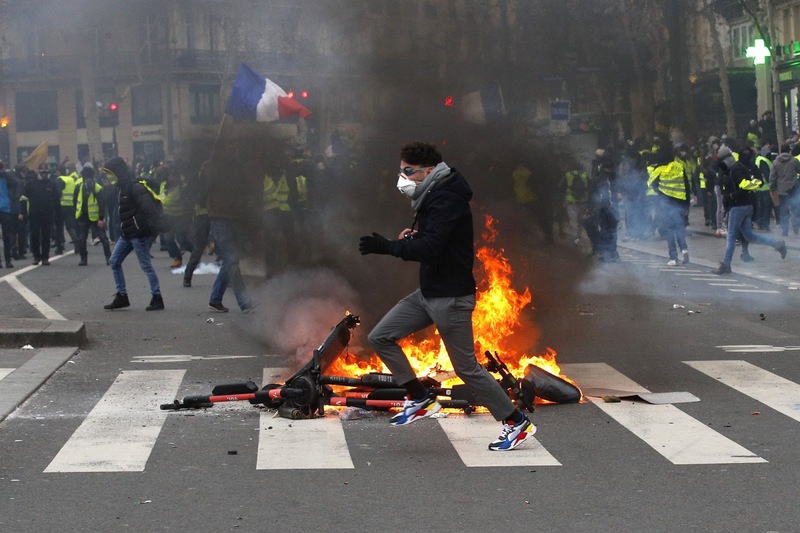 Hundreds of thousands are joining the protests-even many government workers – and Macron’s response is to get out the big guns including VBRG armored vehicles (used in Kosovo and Ivory Coast), water cannons, and tear gas. And this is why Macron needs a Euro army. Even the French police and soldiers are reluctant to fire on their countrymen, but a trans-national army would have no such compunctions. The French people themselves, as much as the Italians or the Poles, should rightfully be wary of the Merkel-Macron army. They linked a few issues into one huge pie. The Euro Army is to put down internal dissent in European countries? If true then people should be quick walked to the guillotines! This whole thing is over unfair taxes? How many revolts have come out because of unfair taxation! The most stunning thing to me is the accusation that Macron launched this whole drama based on one thing. An attempt to poke Trump in the eye. If that's the case then Macron badly calculated. He might be loved in the cosmopolitan areas of the world but back home he's in a hurt locker.